Take a woman's age and body type into account when helping her find the right necklace. Something just didn't look right in the photograph of my good friend. Everything was in focus, her smile was wonderful, but something was wrong. Her necklace threw me off  it didn't frame her face correctly. Choosing the right necklace isn't hard. Several factors steer this decision, including age, body shape and body composition. Gauge by Age: Generally speaking, a woman's age plays a distinct role in determining the length of the necklace she should choose. Younger women with youthful skin should wear necklaces closer to the throat to show off their smooth skin. The gauge or thickness of the necklace should be narrow. Smaller pearls show best on youthful necklines. Pendants and charms should be on the small side too. Younger women who wear bigger, wider and flashier necklaces can look like they're trying to play "dress up" with their mother's jewelry. Older women will want longer chains and necklaces to draw attention away from the neck and any apparent imperfections. Eighteen to 24 inches is a good general length. Gemstones or pendants should be two or more inches below the neckline. The longer necklace "elongates" the neck and frames the hair and face, creating an overall pleasing look. These women can wear bigger and wider chains and necklaces. Pearls and beads should be in excess of 7mm. Keeping size proportional, charms and pendants should be larger too. Short neck: Wear chains starting two inches below the collarbone. Heavy or thick neck: Wear larger chains and necklaces, especially graduated and 18 inches and longer. Long thin neck: Have this customer try a triple strand of pearls, with the shortest strand hugging the base of the throat. The pearls should taper up with the curve of the throat. Avoid V-shaped chains. Softer, rounder necklaces are good, such as an 8mm-10mm omega. Bony neck: Medium to large necklaces. Avoid the base of the neck, the necklace should fall at least one inch below the collarbone. Soft, contoured, fleshy neck: Show this customer a "hard" necklace. Segmented is good, and it should be close to the base of the neck. Try making a statement with an angular pendant. Wide-based neck: Use flexible chains that drape well. Be sure the center is at least one inch below the collar bone. This customer is a good candidate for a longer chain. A 24-30-in. necklace helps negate the wideness at the base of her neck. A graduated necklace  very thin around the side of the neck and much larger below the collarbone  will add visual balance. Choker: At 17-19 inches, the princess-length pearl necklace makes a perfect chain for a pendant or pearl enhancer. It looks great with crew neck tops, and works beautifully for both high necklines and daringly low ones. Matinee: This mid-length pearl necklace, at 20-24 inches, is great with a business suit or a dress. It's not as formal as an opera-length strand or as short as a choker, but is still perfect on its own. Opera: Perfect for a night at the opera or any other dress-up occasion, the opera pearl strand is 28-34 inches in length. Rope: At over 45 inches long, the rope pearl is very luxurious! Pearl Necklace Buying Guide: A pearl necklace adds style to anything she wears. To own a pearl necklace is every woman's desire. When looking for a pearl necklace there are many lengths of pearl necklaces: collar, choker, princess, matinee, opera and rope. Collar pearl necklace are 10 to 13 inches in length and good for casual wear. The 14-16 inch choker is an incomparable classic, and probably the most versatile of all pearl lengths. At 18-20 inches, the princess-length pearl necklace makes a perfect chain for a pendant or pearl enhancer. Matinee pearl necklace are 20 to 24 inches and is great with a business suit or a dress. Opera pearl necklace are 28 to 34 inches and are perfect for for a dress-up occasion. Like the "four Cs" of diamond quality, shopping for pearl necklaces involves paying attention to a few important elements. It is not easy to differentiate between natural pearls and high end cultured pearl with a naked eye. 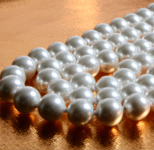 Pearls are believed to be composed of 84% calcium carbonate and 14% organic binder and about 2% water. The usual color of a pearl is white or cream but is also available in pink, grey and black. Choose a pearl necklace, which will match her lifestyle and personality. Choosing a right pearl necklace depends on many factors including age, skin color and occasion. When buying pearl necklace it's a good idea to base your choice of color on skin tone. A young woman wears a pearl necklace it leaves an impression of style, beauty and innocence. An elderly woman wears a pearl necklace it gives an impression of poise, dignity and sophistication. When buying pearl necklace it's a good idea to base your choice of color on the skin tone of the person they are intended for. In general, pink pearls look best on fairer skin tones, while yellow or golden pearls look best on darker skin tones. An elegant pearl necklace is a great gift idea for special days like marriages, anniversaries, birthdays, valentines, mother's day etc. When buying a pearl necklace, there are a few things to keep in mind including surface, color, size, luster, and shape. The pearl necklace is strung in many fashions. The center pearl being bigger and the remaining tapering down the size, is a style in fashion too. The pearl could be bigger or smaller depending on the design, if you prefer big sized pearls then one strand pearl necklace would look beautiful. Browse our collection of elegant pearl necklaces. This luxury gift is a must for jewelry lovers. To shop for necklaces click here.